The light blue box, encompassing the visual cortex and long-term memory, is our mind. The environment becomes manifested inside this blue box. You can think of this as your as memory reaching out to absorb the surrounding environment. Although it “feels” as though the outside world is outside our mind it is actually wholly contained within our memory. During life we live within memory always, including the present. Moments are already absorbed into memory as we experience them. The memories of the past are just as real and complete as the present moment. Memory is continuous and includes everything ever experienced. Simply because we cannot realize past moments fully right now does not mean they don’t exist. Awareness is in the present now. That is the only reason we don’t experience all moments now. If we could move awareness to a moment of the past we would experience that moment exactly like we experienced it the first time. That moment exists. It has not gone anywhere. We just cannot experience it fully at this time. You will however realize past moments fully at some time in the future. The mind capturing and retaining all moments throughout a lifetime requires perfect memory. Is it possible for human memory to achieve this level of perfection? To be possible we need a memory device that can hold every moment you have ever experienced and retain it throughout your lifetime. We need to retain complete realities including thoughts, emotions, and details we weren’t aware of at the time. We need to be able to store them completely and retain them without dropping a bit. We are talking about a bit-for-bit recording of your entire lifetime. This does not seem possible. Everyone knows cells do live indefinitely. We also know there is turnover of memory cells within the brain. It does not seems possible a human mind can make it through 125 years of life without losing any data. It seems the underlying hardware would eventually fail and lose the data that was stored in that hardware. Human memory is not a fragile system. It does not come crashing down when a single brain cell fails. In computers there are ways to lose memory bits without losing the data stored in them. Computer techniques allow a memory device to fail completely without losing data. Computer memory repairs itself by swapping in fresh memory when old memory fails. It can recover from lost data and keep running perfectly. This is not the only way to maintain perfect memory, however it show there is at least one way to do it. 1. If either input is ON and the other input OFF the output is ON. 2. If both inputs are ON output is OFF. 3. If both inputs are OFF output is OFF. 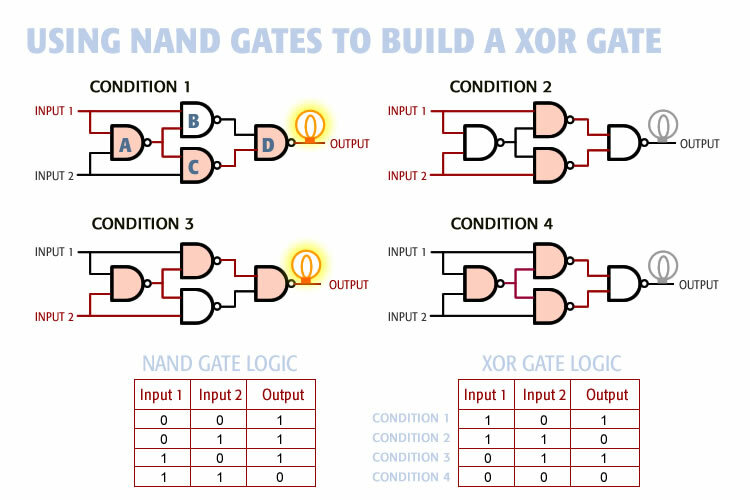 The diagram below shows an XOR Gate built from four NAND Gates. The logic table for the NAND Gate is shown on the lower left. Like an XOR Gate, a NAND Gate has two inputs and one output. If both inputs are ON current the output is OFF. If either or both inputs are OFF the output is ON. Condition 1 (upper left) shows input 1 ON. NAND Gate A has one input one so it turns ON. NAND Gate B has two inputs ON so it turns OFF. NAND Gate C has one input ON so it turns ON. NAND Gate D has one input ON so it turns ON. Condition 2 (upper right) shows both inputs ON. NAND Gate A has both inputs ON so it turns OFF. NAND Gate B has one input ON so it turns ON. NAND Gate C has one input ON so it turns ON. NAND Gate D has both inputs ON so it turns OFF. Condition 3 (lower left) shows input 2 ON. Like condition 1 this turns the Gate ON. Condition 4 (lower right) shows both inputs OFF. NAND Gate A has both inputs OFF so it turns ON. NAND Gate B has one input ON so it turns ON. NAND Gate C has one input ON so it turns ON. NAND Gate D has both inputs ON so it turns OFF. The logic table for the XOR Gate is shown on the lower right. 1. A block of data (Data A) is written to Drive One. 2. Another block of data (Data B) is written to Drive Two. 3. The two pieces of data are XOR’ed together and the result is written to Drive Three. Shown on the left is Data A that includes six bits of data: 001100. This is written to Drive One. Data B also contains six bits: 111000. That data is written to Drive Two. Then Data A and Data B are XOR’ed together and the result is written to Drive Three: 110100. 1. Data C (001010) is written to Drive One. 2. Data D (110011) is written to Drive Three. 3. 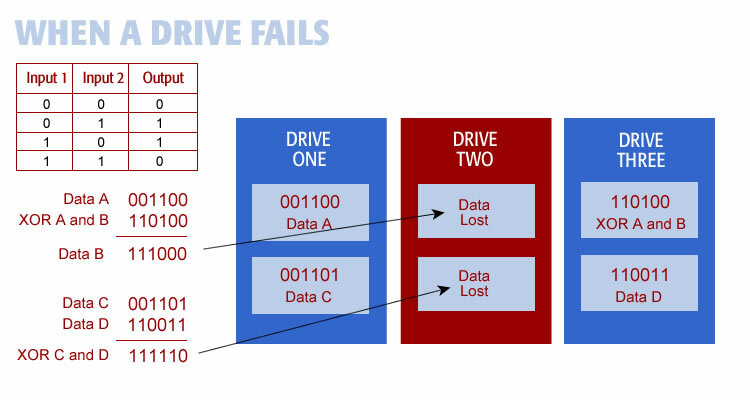 XOR (Data C and Data D) is written to Drive Two. You can see how the data values are XOR’ed together on the left. The illustration above shows Drive Two failing. The drive has failed without warning. All the data on Drive Two has been lost. 1. 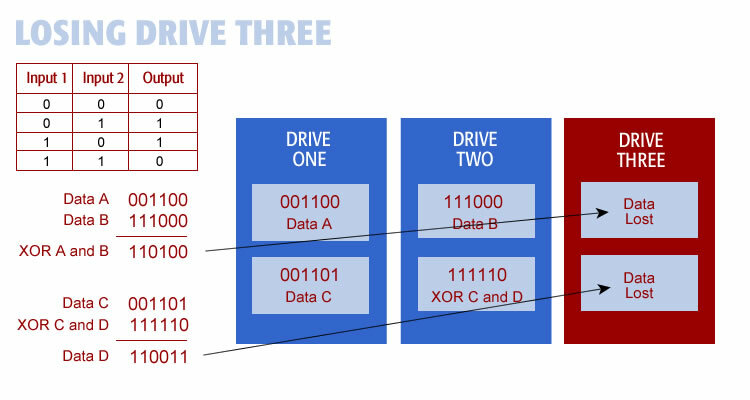 Take the data on Drive One (Data A) and the data on Drive Three (XOR Data A and B) and XOR them together. The result is the data that was lost on Drive Two. 2. Similarly take the data found on Drive One (Data C) and the data on Drive Three (Data D) and XOR them together. The result is the data that was lost on Drive Two. To recover the lost data we do the same thing. Simply take the data on the existing drives, XOR it together., and the result is the missing data. No matter what drive we lose we can recover the lost data. We cannot however, lose two drives. 1. The computer detects that Drive Two has failed. 2. Drive Two is automatically removed. It is swapped out electronically. 3. 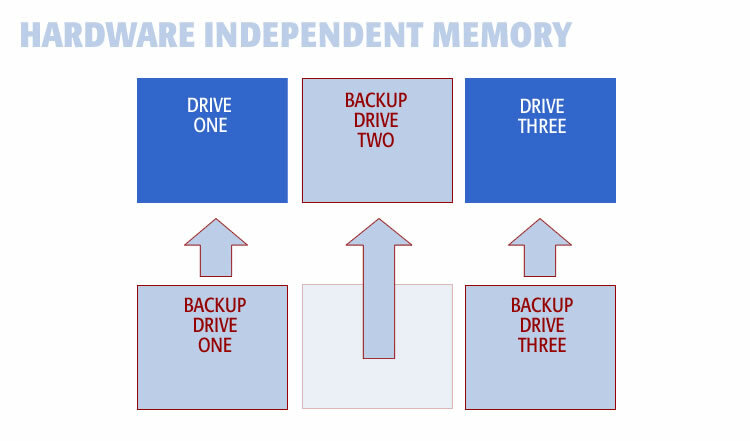 Drive Two’s backup is automatically installed in the array. It is swapped in electronically. 4. 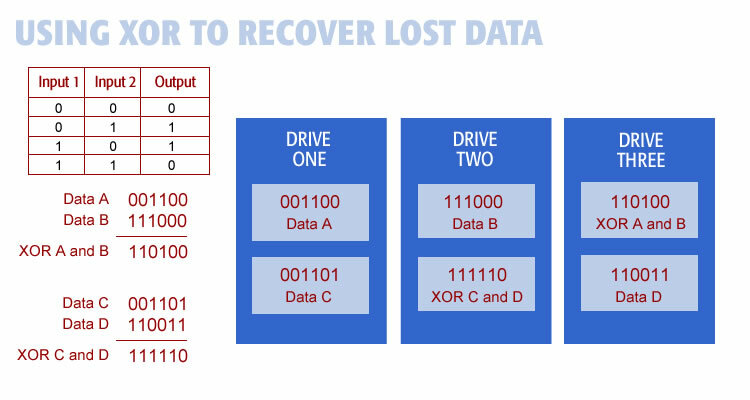 Drive Two’s data is rebuilt by XOR’ing the data on Drives One and Three. 5. The result is written to the new Drive Two. 1. XOR memory can take a severe hit and not lose data. 2. XOR memory repairs itself without moving parts. 3. XOR memory can recover data without warning. Memory can go down suddenly and the system can recover. 4. XOR memory heals itself. Lost memory can be fully rebuilt from existing memory. 5. XOR memory works with any size data word. It works with any number of drives greater than three. 6. XOR memory protects a huge amount of data with very little additional hardware. Humans spend one third of their life sleeping. XOR’ing data is the type of activity that could be taking place during sleep. Using XOR memory (or some variation of it) we are able to replace lost memory hardware while maintaining perfect data. It is important to note a computer system can collect and store data for hundreds of years without dropping a bit using XOR techniques described here. 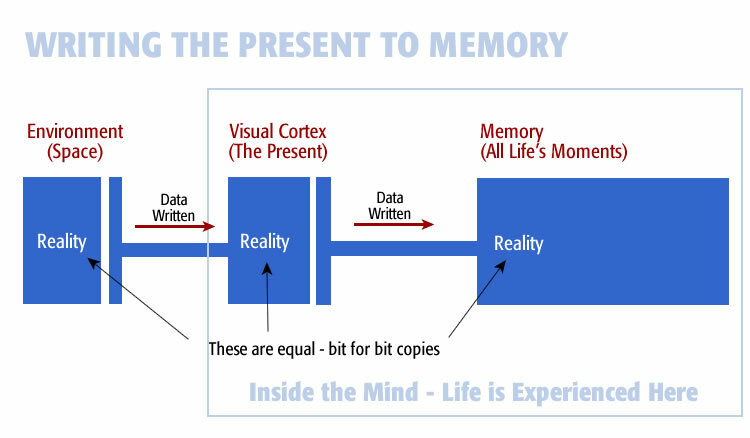 In like manner, human memory stores data perfectly throughout our lifetime, from birth to death, retaining it all.